Now that you have stocked your Thai pantry with Thai Sriracha sauce, homemade or store-bought, it’s time to put it to good use. You can use Sriracha as you would your Tabasco sauce. A lot of people know and do that. But Sriracha as a stir-fry sauce? Why not? The sauce contains garlic, chillis, salt, vinegar, and sugar — all the flavors you need right there. One of my favorite things to make when a hunting trip to the innermost corners of the freezer yields nothing but a bag of frozen shrimp is this stir-fried shrimp with Sriracha sauce. Cut up one medium onion into 1/4-inch slices and saute them in 2 tablespoons of vegetable oil in a skillet over medium-high heat until the onion is tender-crisp. Once that’s done, you add one pound of large shrimp (21-25 count) which have been peeled and deveined, to the pan along with 1/2 cup of Thai Sriracha sauce*, stir, cover, and let everything cook together over medium heat for 6-7 minutes or until the shrimp is cooked through (don’t overcook your shrimp). 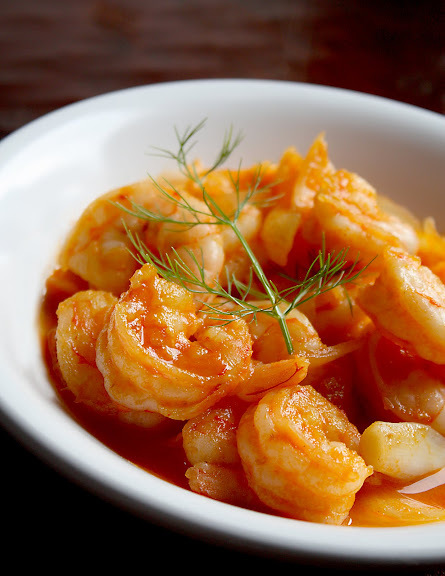 If you end up with thin or excessive liquid, remove the shrimp from the pan and reduce the sauce down to desired consistency. Adjust seasoning to taste. Serve over warm jasmine rice. This makes enough for two hungry people. Variations: Replace the shrimp with an equal amount of sliced squid, pre-seared tofu chunks, chicken breast meat, or thin slices of pork tenderloin. Oops, I think I forgot something when trying to post and so I think that one went into cyberspace. My question was, given that I ony have Rooster sauce and being unsure if I can get the Thai one, how would I adjust this recipe? Elsie – The Rooster sauce is spicier and much less sweet than Sriracha. I’d say start off with 3 tablespoons of the Rooster sauce and 1 teaspoon of sugar per one pound of shrimp. Then taste and adjust seasoning to taste just before you take the stir-fry off the heat. Nice photo. I love good spicy stir fry! In addition to Thai sriracha (liked your recipe), I also make this with sambal oelek and some added palm sugar and garlic. Occasonally I’ll throw in heavy cream and some European Maggi and toss in a little basil toward the end. My boss at the restaurant likes that one a lot. This shrimp is looking gorgeous! Sounds incredible with sriracha sauce! I made this tonight using sea scallops and it was delicious. Perfect midweek recipe: a few ingredients, prepped and cooked in the time it takes to cook rice, big taste. Love how simple this is and yet here I am am on a plane 30,000 ft above some fly-over state and I’m wishing I had a stove, shrimp and some sriracha. This was absolutely fantastic. My husband likes a lot of heat (He eats Thai bird chilis – raw) me, not so much, so I was worried it would be too hot. But, I took the bull by the horns so to speak, and made them with the amount of sauce called for, and they were perfect. Thank you for this recipe! Spicy, spicy. Sriracha does just what it needs to do when you want to add heat. I was so excited to find this and serve it at home. I went to the store though and no sriracha – rooster sauce or other brand! Amazingly there was sambal (which I knew about from your other post). My dish turned out great! Thanks for the inspiration. Hi Leela, Its easier for me to get lobster than shrimp. im planning to use the huy fong sriracha ive already seen the modification needed for that, but could you give me an idea of cook time if i choose lobster instead?… and maybe if i would have to do anything else differently? Do you think the recipe would transfer well to lobster? Sorry. No idea. 🙁 I figured if you cut up lobster tails into the same size as shrimp, they would cook at the same rate. But I have no first-hand experience cooking this recipe with lobster. I made this with the store bought rooster sauce. I did 3 tbs sauce and 1 tbs sugar and boy was it spicy. Great flavor and a beautiful dish but I’m going to make your recipe for sriracha next time because it sure made my nose run.